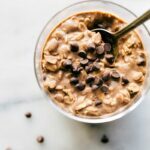 A double-chocolate, brownie flavored batch of overnight oats. These take minutes to prepare and taste so good it will be like eating dessert for breakfast. 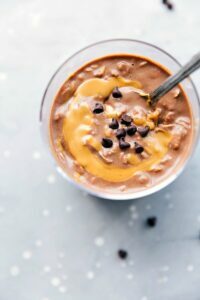 These overnight oats were one of my staple meals in college — extra chocolatey and packed with protein! With all the studying and running from one class to the next a filling breakfast was a must. A lot of people ask if they should heat up their overnight oats — I don’t, but you absolutely can. I like them cold and straight out of the fridge. 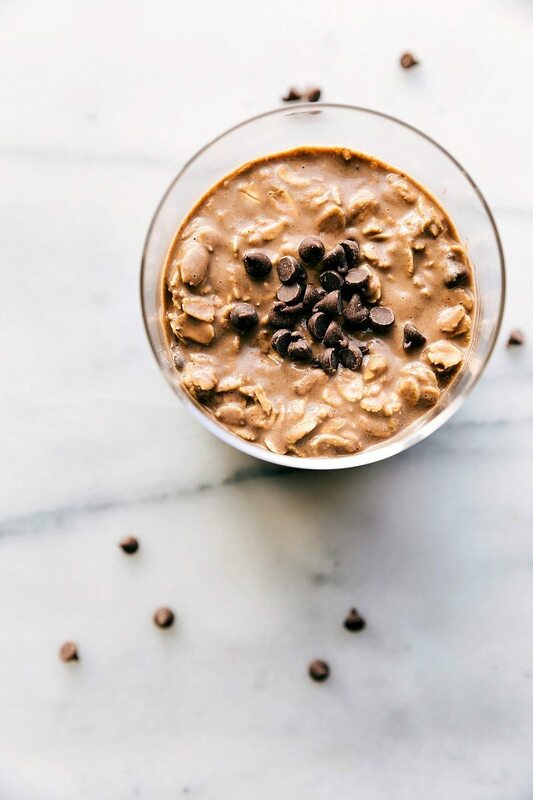 Sometimes I even make the “overnight” oats before I get ready for the day and enjoy them half an hour a later — they are delicious plus so quick and easy to make! 1/4 cup vanilla yogurt I've also tried chocolate yogurt mousse whips yogurt (by Yoplait) and am OBSESSED. Stir in the oats. Taste and add sweetener of choice if desired. Place into a tightly re-sealable jar or tupperware in the fridge overnight OR stick in your fridge for about 20 minutes. In the morning, top with miniature chocolate chips and stir throughout. This is optional but makes these "double-chocolate" and super delicious!! Adding brownie mix sounds like a delicious idea! Looks really great! Chelsea, you just mix together, refrigerate, and eat them? No cooking…….. it’s like a granola? Wow….that’s an awesome breakfast on the go!!!!! Brownie batter IN my oats?! 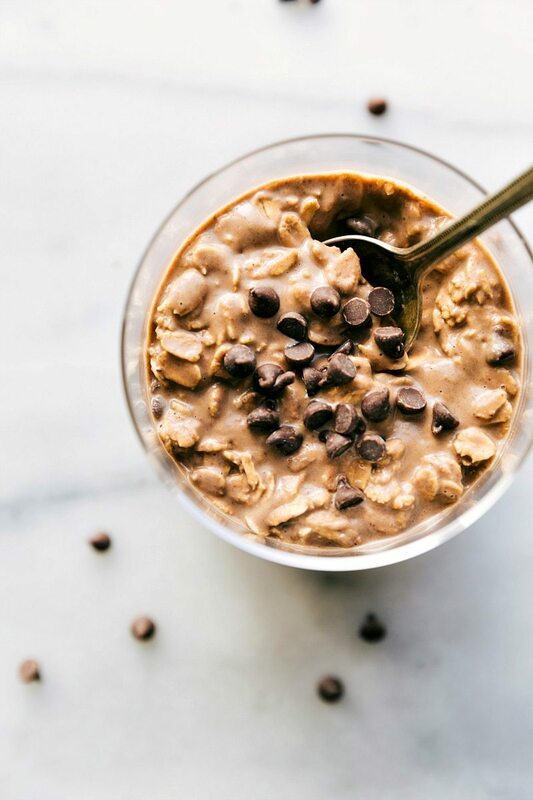 A secretly healthy breakfast since it has oats…I am in. Pinned! I love this! I’ve only ever made overnight oats with yogurt but since I’m trying to cut out dairy, I haven’t had them in forever! I want some! So I’m seriously allowed to eat this and call it breakfast?!? Sweet! oh wow- what a great idea! love this. overnight oats are the best! You totally just convinced me to give overnight oats another shot. This looks absolutely amazing, Chelsea! Dessert for breakfast, but in healthy form, has me sold. Can’t wait to try this out! Whoa whoa whoa – brownie batter in oatmeal?! How did I never think of this?! This looks so insanely delicious!! Can’t wait to try it! Brownie batter in oats is such a great idea! Love that I can have chocolate for breakfast 🙂 This looks delicious! Chelsea this is awesome! I was just thinking about whipping up some overnight oats (don’t judge me, but I’ve never had them before!) and I didn’t know where to start, But now I do! Dessert for breakfast here I come! This looks delicious, I think I could totally do some for dessert right now…! So I’ve been doing overnight oats wrong this whole time! I’ve NEVER used chocolate! I NEED to try these! That looks so perfect. 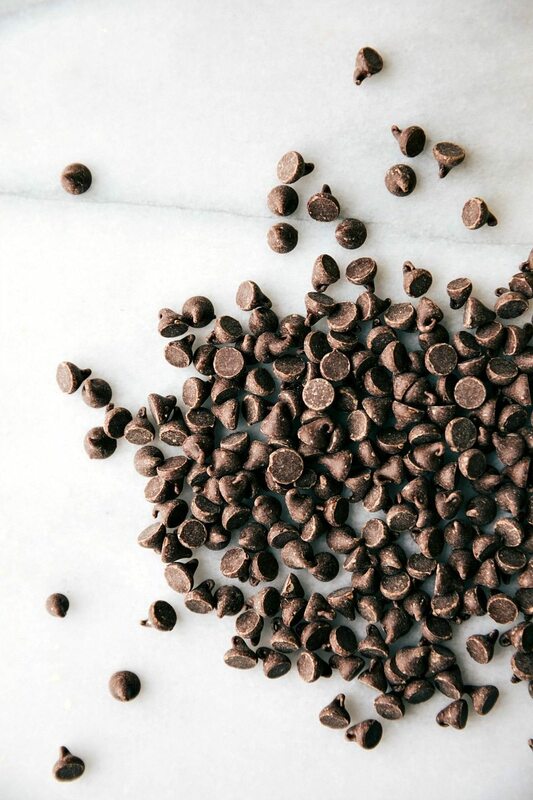 Chocolate chips sprinkled. Then you added the cherry which took it to a WHOLE NOTHA LEVEL. You can if you really want, but it will be a peanut butter flavored oats and not so much chocolate/brownie batter flavored. 🙂 The almond butter allows for the chocolate flavors to really shine through.